I am once again hosting a Picnic in the Park on the Sunday after Memorial Day Weekend! I hope you and your family and friends will join me for games, bbq, ice cream, and to meet neighbors from around the district! After a demanding 90 days, the General Assembly’s 2016 legislative session has ended. From January 13th – April 11th, the General Assembly met to debate and pass bills that affect residents across the State, including the FY17 operating and capital budgets. I have continued to advocate for causes important to Baltimore, including more efficient and effective transportation, criminal justice reform, environmental issues, and support for Baltimore City and its schools. I am excited to share my second End of Session Report to keep you updated on my work in Annapolis this year. To download a PDF of this report, click here. In this report, I’ll provide updates and summaries on the major issues from this session, but with limited space I cannot report on all of the bills that we worked on. To read more, please sign up for my email updates and visit my blog at www.brookelierman.com. If at any time you have questions or concerns, don’t hesitate to contact my office at (410) 841-3319 or brooke.lierman@house.state.md.us. Apprenticeship Career Training in Our Neighborhoods (ACTION) Program (HB 290) – Creates an apprenticeship program that provides employers $1,000 per new apprentice and is targeted to zip codes with poverty rates of at least 20%. P-TECH Schools Act of 2016 (HB 464) – Helps fund a model that allows students to graduate from public high school with a diploma and an associate degree or other pre–apprenticeship or career certificate. Two Baltimore City High Schools will offer this new program. Smart Demolition and Smart Growth Impact Fund (HB 686) – Codifies the Strategic Demolition Program that provides state funding to local governments, including millions for Baltimore. Baltimore Regional Neighborhood Initiative (HB 684) – Codifies the successful neighborhood revitalization grant program with an annual appropriation of $12 million starting in FY18 to provide flexible funding to community development corporations in designated and under-served communities (including Southeast Baltimore, Brooklyn, and Curtis Bay). Seed Community Development Anchor Institution Fund (HB 1400) – Provides matching state funds to anchor institutions to leverage their resources in under-served communities. Enoch Pratt Free Library Funding (HB 1401) – Provides funding for expanded access to public libraries and bolsters the role of libraries as community anchors. Next Generation Scholars of Maryland (HB 1403) – Expands eligibility to 7th and 8th grade students for the Guaranteed Access Grant program. This Grant provides college scholarships to students who meet a rigorous academic and social criteria through middle and high school. I serve on the Appropriations Committee, and two of its subcommittees – the Transportation and Environment Subcommittee and the Pensions Subcommittee. Much of my time and effort during session involved work in these committees on our state’s FY17 operating and capital budgets. Under the Maryland Constitution, the General Assembly must pass a balanced budget each year. Maryland has a “strong executive” model: the Governor proposes the initial budget early in session and the Assembly can then only cut or restrict funds in the operating budget (although it can add to the capital budget). In the budget, the State’s support for public schools exceeds $6.3 billion. The budget also includes $19.4 million for five school systems that have lost enrollment and aid in recent years, including over $10 million for Baltimore. An additional $19 million in budgetary savings is restricted for grants to help school systems fund the increase in their share of teachers’ retirement costs. Community colleges will receive a 5.4% funding increase. This budget provides nearly $10 billion in funding for Medicaid, including $346 million for rate increases for health care providers. The Affordable Care Act has expanded Medicaid coverage to an additional 1.2 million Marylanders. The budget also includes over $63 million for the developmentally disabled and $36 million for the required 3.5% community provider increase to help ensure patients are able to find doctors who take Medicaid and that providers for the developmentally disabled are appropriately paid. The operating budget is balanced and closes the structural deficit. Ongoing general fund revenues exceed ongoing expenses by $139 million. We have a general fund balance of over $400 million, and our Rainy Day Fund exceeds $1 billion. The budget fully funds our pension obligations as well. Our budget fully funds the Chesapeake Bay 2010 Trust Fund for the first time since its creation. The budget also adds $60 million in funding to land preservation programs over the next two years. The budget includes a record $20.3 million appropriation for the Maryland Arts Council. Through budget narrative, I worked with the Committee to secure language requiring DNR to submit plans to maintain & expand state parks; Dept. of Planning to report on status of preservation programs; DLLR to report on enforcement of wage/hour laws; University of Maryland to provide information on the fees its schools charge; and MDE/MDA to report whether they have adequate staff to enforce environmental regulations. Other budget language will require additional reports from other Agencies. The District 46 team secured funding for multiple projects in our district, including the following: Port Discovery – $500,000; Baltimore Regional Ed & Training Center (CASA & SE CDC collaboration) – $430,000; Creative Alliance – $250,000; Leadenhall Community Outreach Center – $500,000; The Baltimore Museum of Industry – $200,000; Peale Museum – $400,000; Healthcare for the Homeless Dental Clinic – $17,500. Maryland Transit Administration Oversight and Planning Board (HB 1010) – This bill creates an MTA Oversight and Planning Board, codifies existing advisory councils, and requires MTA to begin engaging in comprehensive planning for transit systems in the greater Baltimore region. The Board will allow for increased effectiveness, efficiency, and accountability to the people and local governments that MTA serves. This bill is on its way to the Governor’s desk! Maryland Open Transportation Investment Decision Act of 2016 (HB 1013) – Although not the lead sponsor, I was asked by my Committee Chair to be the Floor Leader on this important transparency bill. I lead the floor debate to both pass the bill and to override the Governor’s veto. HB 1013 requires MDOT to create a project-scoring system based on our state transportation goals to provide objective and transparent data on certain projects in MTA/SHA. Community Cleanup and Greening Act of 2016 (HB 31) – Plastic bags make up a large percentage of the litter in our neighborhood streets, communities, and waterways, including streams and rivers that flow to the Chesapeake Bay. HB 31 would have banned disposable plastic bags and required retailers to charge 10 cents for each paper bag requested by a customer. Unfortunately, the bill died this year when the Committee gave it an unfavorable report. Civil Penalties for Shoplifting and Employee Theft–Repeal (HB 190) – Current law allows for private corporations to send extortionate letters demanding up to $1000 in compensation to people they suspect of shoplifting or theft (regardless of guilt). The original bill would have repealed the law. In its final form, it reforms the law to provide safeguards for innocent consumers, and requires reporting by any company wishing to engage in this practice. This bill is on its way to the Governor’s desk! Income Tax Subtraction Modification – College Savings Plans (HB 335) – This bill reduces the administrative burden of saving money in a college savings account by allowing anyone to take the available deduction (of up to $2,500) for investing in a student’s §529 college savings plan. It reduces red tape and encourages saving for college. It is on its way to the Governor’s desk! Alicia’s Law (HB 1490/SB 864) –More than 10,000 computers have been identified as trading depictions of child sexual exploitation in Maryland. This bill creates a special fund to investigate and prosecute internet-based crimes & sexual exploitation of children. It will provide $2 million per year to law enforcement and child advocacy centers. SB 864 is on its way to the Governor’s desk! Food Stamp Program – Minimum Benefit (HB 445) – Over 29,000 Marylanders receive only $16 per month to help pay for food. Because the federal government has cut the SNAP program, many Marylanders – especially seniors – are going hungry. This bill supplements the federal SNAP benefits to ensure that no Maryland SNAP recipient aged 62 or over will receive less than $30 a month. This bill is on its way to the Governor’s desk! Justice Reinvestment Act (SB 1005) – One of the most important bills the House passed this session, the JRA, could be called the “Smart on Crime Act.” This bill enacts several proven and important criminal justice reforms, including expanded use of drug treatment instead of jail, and additional expungement & reentry resources. I offered an amendment that was adopted to fund re-entry programs through the use of an opportunity compact or social impact bond. Passed. Freedom to Vote Act (HB 1007) – Lowers the barrier that voter registration causes by requiring various state agencies and boards of elections to adopt measures that increase access. Passed. Public Safety and Policing Workgroup Recommendations (HB 1016) – Focuses on police accountability and will address training, mental health evaluations, community policing, whistleblower protections, and civilian participation on police review panels. Passed. Maryland Healthy Working Families Act (HB 580) – Requires businesses with more than 15 employees to provide earned sick leave to employees who work 8+ hours per week. Passed the House; failed in the Senate. Baltimore City – Pub Crawl Promoter’s Permits (HB 1068) – Creates a permit process to help the City regulate pub crawls. Passed both chambers. Ken Capone Equal Employment Act (HB 420) – Phases out the use of sub-minimum wages for employees with a disability. Passed both chambers. If you are facing any difficulty working with a State agency or have other concerns, please contact my office. My (new) legislative aide, Michele Lambert, or I will be happy to work with you to try to remedy the issue. 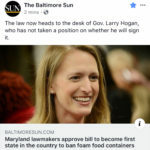 Our office phone number is (410) 841-3319, and Michele and I can be reached by email at brooke.lierman@house.state.md.us.Please keep in touch. The past two weeks were busy with budget briefings and visits with constituents! Last week, I was honored to speak at a rally to preserve funding for providers treating behavioral health conditions. The rally to help “Keep the Door Open” to patients was a huge success, and I hope that we are able to pass this important legislation to make sure anyone can get the treatment they need. This is the first of the bi-weekly updates that I will send out and post on my website regarding the 2016 General Assembly Session. The 2016 Session has started off strong! Leaders have informed us that there have been a record-level of bills requested for drafting, meaning we may have some very long days in hearings and on the floor voting. (This is a picture of me and my friends and fellow Baltimore legislators, Cory McCray and Antonio Hayes). Another year has ended, and a new one has begun. Today we are one week away from the start of my second session in the General Assembly. 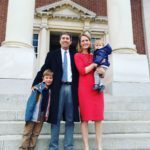 Last year was certainly a milestone year for me and my family, as I was sworn in as a State Delegate in January, appointed to the Appropriations Committee, and worked to effectively represent District 46. It was also a milestone year – in a very different way – for Baltimore. The unrest and uprising that occurred in April following the tragic death of Freddie Gray lead to a renewed call for urgency to address the longstanding disparities in our City – disparities caused by a long history of racism and segregation, but disparities that every person I have met in Baltimore truly desires to end. It is my hope that in 2016 we will continue to be vigilant and urgent in our work to address the housing, educational, social, and economic disparities plaguing our City. We will only succeed as a City when every child has an equal opportunity for success. What a difference a year makes. This time last year, the polls were just opening. I was standing at William Paca Elementary School, waiting to greet the first voters of the day, and knowing that no matter the outcome of the election, I had run the best campaign I could. Looking back over my campaign, as I do from time to time, I am still inspired and grateful for the many people who helped carry me across the finish line – into a first place victory! If not for you and them, I would not be where I am today – able to represent the residents of Baltimore City in the General Assembly. All are invited to my first annual Community Picnic in the Park! Join me and my family, other elected officials, and your neighbors from around District 46 for food, facepainting, games, and ice cream! Information about schools and community programs will also be available. Sunday, May 31 from 2-4 p.m. at Patterson Park (northeast of the Pagoda). 2015 General Assembly Session: Adjourned! Friends – I can hardly believe that my first session in the General Assembly has come to an end! I never knew that 90 days could go so by so quickly! I have learned so much – both substantive information about policies, and procedurally, so much about how the legislative process works (or sometimes doesn’t work as the case may be!). April 15, 2015 / In Uncategorized / By Brooke Lierman / Comments Off on 2015 General Assembly Session: Adjourned!